Patrolling these shores were a succession of corsairs among whom was the Englishman Charter Yachts Sailing Turkey John Ward, he of ballad fame, who was here three thousand years later. In February of 1607 Ward was in the western Aegean where he took in quick succession the Venetian galleon Rubi and a smaller Venetian, Carminati, bound from Athens to Venice with cargoes originating in the Levant. One of John Ward's more infamous exploits taking place two months later was the capture below the Gulf of Antalya of a large Venetian merchantman bound from Syria and Cyprus to Rhodes Town near Gocek. 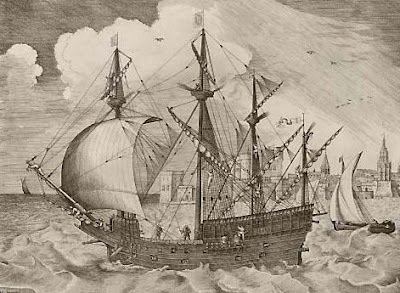 Called Reniera e Soderina, this heavily-armed argosy was overtaken in calm weather by two of Ward's lighter and faster raiders, bretones or round ships as depicted to the right, each nevertheless said to have mounted 40 guns and to have carried more than 100 armed men. The captured cargo was indigo, silk, cinnamon and cotton worth at least 100,000 pounds sterling at a time when sterling had value. Within months of her capture Ward had modified the Reniera's hull to that of a bretone and hoisted to her masthead an admiral's pennant. The pirates owed much of their success to new technology. They brought with them into the Mediterranean high-sided sailing ships that the Italians called bertoni. They looked fairly similar to the galleons that were coming into fashion in the Spanish and Venetian navies, but they possessed a deep, strong keel and functioned well with three square-rigged sails. They were not especially large and they carried crews of around sixty, with one cannon for about every three men. When their rivals within the Mediterranean managed to capture these ships, they made every use of them; they even purchased them from English and Dutch captains. Yet Venice was strangely conservative. Lateen-rigged galleys had defended the city’s trade and empire for many centuries, and attempts to convince the Venetian government that the new type of ship was vital to the defence of the republic fell on deaf ears. The Venetian elite could not understand why what had worked in the thirteenth century would not work in the seventeenth. Bertoni became a common sight in Venice only in the early seventeenth century, when the republic begged England and Holland to support its struggle against the Austrian Habsburgs. By 1619 the Venetian navy possessed fifty bertoni alongside fifty galleys. Yet even when Venetian captains sailed bertoni, they seemed unable to challenge the superior skill of northern seamen. In 1603 the Santa Maria della Grazia, a Venetian bertone, was heading for Alexandria when it was captured off Crete – Venetian territory. Then, once released, it was seized at night-time while sailing up the Adriatic, and deprived of its guns. The Italians were no longer near invincible at sea. Northerners also attacked northerners; the relationship between the English and the Dutch oscillated violently in the late sixteenth and early seventeenth centuries. In 1603 Thomas Sherley, in command of a motley crew of English, Italian and Greek sailors, attacked two Dutch ships carrying Aegean grain from the Cyclades to Genoa. Sherley was content to pose as the agent of the Medici duke of Tuscany, and as a sort of crusader against the Turks, though quite how an attack on the Dutch fitted into this is a mystery. Sherley had to write to the duke to explain himself, because he had clearly over-reached himself. The Medici were happy to buy English bertoni and to employ English sailors. The duke even obtained his gunpowder from England. He wondered whether it might be a good idea to lure John Ward into his service, since he seemed such an effective corsair. The duke of Savoy, whose territory extended down to Nice, was happy to make his flag and his port at Villefranche available to all sorts of dubious sailors. As Alberto Tenenti pointed out, ‘in the Mediterranean at the end of the sixteenth century, a real change was taking place, psychological as well as naval and commercial’: the spirit of the crusade had been replaced by a cynicism which was occasionally masked by the language of holy war, but among the pirates that was belied by their willing cooperation with Turks and Moors. The clearest indication of this was provided by the Knights of Santo Stefano: by the seventeenth century they were freebooters able to benefit from the handsome concessions made to them by the Medici dukes of Tuscany. Silk-stockings, Carpets, Brande-wine, Silk Neckcloaths, also very fine: Cabidges, Carrets, Turnips, Nuts, The last a man may eat from Sluts: Lemmons, Orenges, and good Figs, Seracusa Wine also, and Eggs. In Livorno, Baltharpe was delighted to find excellent fish, ‘which ’mongst Italians is a good dish’, while at ‘Cales’, or Cagliari, ‘nothing was scant’. Even at Alicante, where meat was scarce and ‘instead of English Cheese, and Butter, A little Oyl we get, God wot, far worser’, there was the consolation of plenty of red wine – ‘this blood of Bulls . . . ’Tis sweet, Delicious, very tempting, The Bottle is not long a emptying’. Looking into the future, the efforts of Lord Nelson around 1800 to keep his men supplied with Sicilian lemons – 30,000 gallons a year, made available to the entire British Navy – ensured that his crews in the Mediterranean and beyond did not suffer from scurvy. The interest of northerners in the Mediterranean was accentuated by the rising standard of living in the sixteenth century, and, even though this stalled in the seventeenth century, the northerners became a permanent presence after Lepanto. Their identity varied: the Hanseatic Germans were pioneers (arriving when Mediterranean harvests failed in 1587), but did not maintain a strong presence, while the ‘Flemish’ increasingly consisted of mainly Protestant Dutch from the rebellious northern provinces of the Spanish Netherlands, rather than the Catholics of Flanders proper. The rise of the Dutch navies began with the emergence of Antwerp as the hub of the Portuguese spice trade with the East, but Dutch prosperity was based on profits from expanding trade and piracy in the Mediterranean just as much as it was based on the proceeds of its Atlantic and Indian Ocean traffic. When the United Provinces established their de facto independence from Spain, business shifted increasingly to the shipyards of Holland. Within the Mediterranean there was some cooperation, at first, with the French merchants who were beginning to make headway in North Africa, and occasionally allowed Dutch ships to fly the French flag (guaranteeing their safety in Ottoman waters). The phrase ‘flag of convenience’ is especially apt: captains switched back and forth, to gain whatever protection a particular nation could claim from the rulers of the Mediterranean shores and islands.